Each of us possesses unique traits that make up who we are as individuals. This is no secret; for as long as humans have been, well, humans, we’ve across cultures spoken about what’s inside us. While these cultures and societies speak in different ways of what makes us, us, there’s no getting around the fact that we all have traits that define us as individuals. Genetic testing provides more clarity into what these “traits” are. Rather, it helps us better understand our makeup that gives us these traits, such as eye color, hair color, and each defining characteristic. But, you may be asking why this matters for athletes; eye color doesn’t really make a difference in athletic performance, right? Most athletes probably aren’t too concerned with their genetics in regard to eye and hair color, at least in how it relates to their performance. But, if we dig just a bit deeper into what our genetic testing results can tell us about our genetic makeup, then athletes can then better understand how to make their genetic makeup work for them, rather than against them; some athletes learn that they possess genes that make burning calories more difficult while others learn that they have the “speed gene” (more on that later). And, for most, simply learning more about their genetic makeup allows them to make dietary, training and overall lifestyle choices that are most appropriate for their bodies and how to improve their athletic performance. 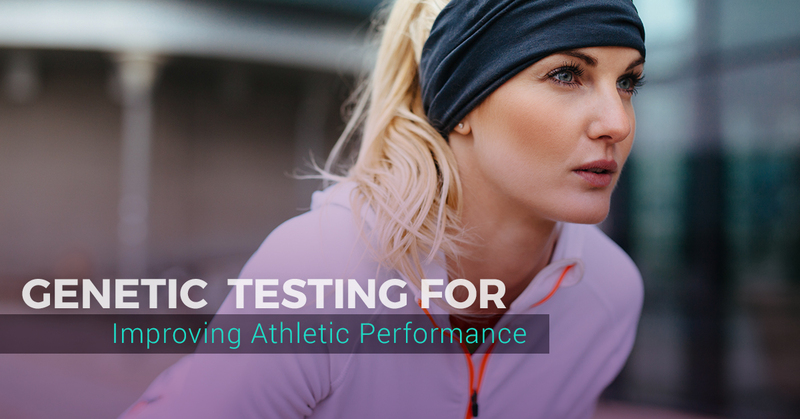 While genetic testing is no panacea for each hurdle athletes face, its results and the athletes’ response to these results are where the power lies for improve athletic performance. Let’s get into the details. Before we get into how genetic testing can benefit athletes and their performance, we first need to understand what genetic testing is — and what it isn’t. Simply put, genomics is the study of the assembly, sequence, structure, and analysis of the function of the genome. Further, the study of genetics’ reversal modifications in gene expression caused by external and/or environmental factors that control your genes’ on-and-off function is called epigenetics. In 1990, the Human Genome Project was begun and, after thirteen years of grueling research, the internationally collaborative research program was completed after successfully mapping the human genome. This process allowed us to read the 3 billion base pairs of genes that comprise a person’s complete genetic makeup. Perhaps one of the most important gleanings from this massive undertaking was not just how to read our genome, but how to apply the information from the reading to our lives; certain genes are responsible for specific characteristics. The more we understand about these genes the more we understand about how the food we eat and the exercise regimens we utilize impact (whether positively or negatively) our bodies. This is especially important information for athletes, particularly Olympians or competitive athletes. With the cost of genetic testing now at an affordable price, it’s becoming available to athletes of all levels. With this much information at athletes’ fingertips, how can it benefit them? While there are dietary guidelines that provide modern humans with insight into generalized caloric and nutritional intake, they are just that: guidelines. And, while these guidelines have aided us well, they simply don’t offer a level of specificity needed to give athletes (and non-athletes alike) the chance to tailor their diet to best benefit their bodies. Everyone’s body reacts differently to certain foods and food combinations, whether positively or negatively. 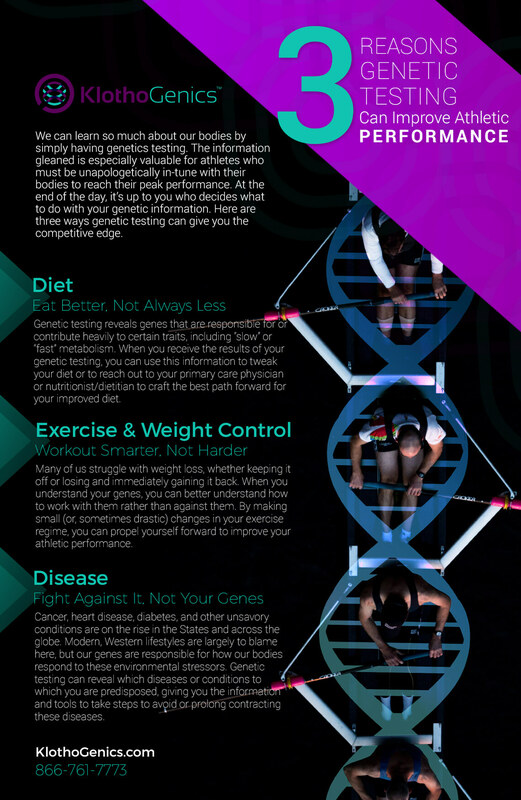 Athletes are often more “in tune” with their bodies than most non-athletes, giving them an extra advantage when they learn more about their genetic makeup. When athletes become aware of their genetic makeup, they can then consult their primary care physician and/or dietitian about how to best proceed in crafting a diet that is most beneficial for their body. For some athletes, certain vitamins and nutrients better aid them than others. While for others, those same vitamins and nutrients may not be needed as much. These genetic results are also important for understanding how our bodies respond to certain foods. Since athletes actively try to avoid inflammation-causing foods, understanding how their bodies react to lactose or gluten — two common allergens for many people — can make a massive difference in how they eat, how they train, and how they recover from training and competition. We hear a lot of talk about metabolism, the body’s mechanism for converting food into energy to sustain life, to convert this food into building blocks for proteins, nucleic acids, lipids, and some carbs, and expelling nitrogenous waste. But, for most of us, we focus on the former rather than the middle and latter functions. Really, we hear about metabolism every time we get an add for the next revolutionary diet pill, weight loss supplement, or get-fit-quick scheme. Both athletes and non-athletes alike speak of their metabolism and how it either benefits them in or hinders them from making positive strides in weight loss or weight maintenance. Since we’re often most concerned with how efficient our metabolism is at burning fuel and fat, let’s discuss how genetic testing provides insight into how we can make our metabolism work for us rather than against us. While the results some receive may very well explain why they have difficulty keeping weight off, this is actually a good, productive step towards combating a “slower” metabolism. Bluntly, when you know there’s something preventing you from keeping off excess weight, you can then take steps towards overcoming or, at the very least, eating and working out in ways that make the most sense for your body’s metabolism. For those who find (perhaps not so surprisingly to them) that their metabolism is “faster” and burns more fuel more efficiently, this can be seen as confirmation that their current food intake is well on par for their body’s metabolism. However, this is not to suggest that this information can’t be valuable to those with faster metabolism; choosing which steps to take for your genetic information is crucial to getting the most from your body while giving it the best food and exercise you’re able to give it. While diet and exercise are our foci in this entry, there are other insights to be gained from the results of genetic testing. Various types of cancers have sadly become household words for many of us. Either we, our family members, or friends, have either suffered from or known someone who has suffered from cancer. With cancer rates on the rise, many (including athletes and non-athletes alike) are wondering what they can do in an attempt to prevent or at least mitigate the effects of cancer. While there’s simply no single way to ensure you’ll never suffer from cancer, having the information from a genetic test can help prepare you for steps to take in attempt to prevent it. Even if you’re not concerned about cancer, understanding your genetic makeup and which (if any) genes predispose you to certain conditions like heart disease and diabetes. For athletes who are concerned about their overall health and their career longevity, having this information is a powerful tool to add to their arsenal. Simply put, having genetic information opens a world of understanding and possibility for both athletes and non-athletes alike. By having genetic information, you can then reach out to your primary care physician, trainer, coach, nutritionist, or other medical and dietary professionals in your life who can offer you approaches into how you can best work with your genes. If you feel that you or an athlete in your life could benefit from genetic testing, reach out to KlothoGenics today to learn more about how we can help you get the tools to make informed decisions about how to reach your true athletic potential.